10- RIDES: 14 rides, and a 50-foot ferris wheel is certain to keep your whole family entertained for hours! 9- COMPETITIVE EXHIBITS: Do you make a killer apple pie? A mouthwatering strawberry jam? Are your zucchini growing exceptionally well this year? Enter them in the fair! 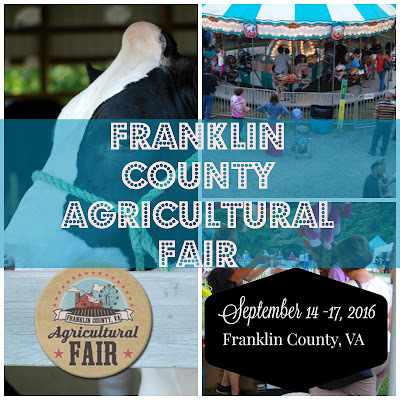 Be sure to stop by the Monday before the fair begins with your entries. Who knows? Maybe you'll win a ribbon and a cash prize! Note: There has been a new category added this year- Children's Artwork Ages Pre-K through 7th Grade. 8- PET AND LIVESTOCK SHOWS: Throughout the week different animals will be shown. Cows, sheep, goats, dogs, poultry, and small critters. Sign up now to show your favorite furry or feathered friend! 7- LADIES FRYING PAN TOSS: Note: this pan is NOT light. It is cast iron, so ladies, be careful! 6- HANDSOME MAN CONTEST: Wash, trim, wax and style those mustaches and beards! You know you've wanted to show off your facial masterpiece for the county to see for a while now, so I say, go for it. 5- K-9 FRISBEE DOGS SHOW: The Frisbee Dogs, will perform throughout the duration of the fair. Stop by and enjoy these amazing, acrobatic friends. And know, they love to invite participants from the audience. 4- PETTING ZOO: Do your children adore animals? In addition to the livestock and small critters show, the Little Critters Traveling Petting Zoo will be set up for children of all ages to enjoy. 3- BMX SHOW: One of my kids favorite events is the Dialed Action Sports Team. It doesn't matter which day you attend since the BMX bikers will be performing all four days. 2- The HARVESTER STAGE: A wide variety of professional bands will be performing on the stage throughout the event ranging from gospel to bluegrass to folk. Additionally, an open stage will be available to past and present residents of Franlin County in fifteen minute slots, pre-registration is required. 1- RIDE THE COOL BUS: If you homeschool like we do, then it's possible that your kids rarely, if ever, find themselves inside of a school bus. What's better than a school bus? The TNT Auto Body Cool Bus! Park across the street and travel in style in one of the shuttles. If you're lucky, the shuttle you grab might be the legendary Cool Bus. Check out FCAGFAIR.com for more Information! Disclaimer: This post is brought to you by the Franklin County Agricultural Fair. All opinions stated here are my own.